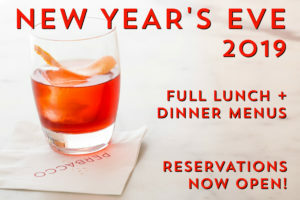 Celebrate New Year’s Eve at Perbacco! We will be open all day on Monday, December 31st serving lunch, happy hour, and dinner to wrap up 2018. To make reservations to join us, please call (415) 955-0663 or reserve online here.